2K's XCom shooter might not see the light of day until sometime in 2014. The whole XCom situation is weird. Fans were disappointed when a promised revival turned out to be a "reimagining" of the franchise as a shooter, but perked up a bit when that shooter started to look like a pretty cool take on the series. Set in the 1950s, the game will be a sort of prequel to the full-blown alien invasion of the original X-Com: UFO Defense, with a unique visual style that combines the down-home look of the Midwestern United States with pre-Fallout futuristic technology and of course an elite team of J. Edgar's best. But then a "real" X-Com remake was announced, XCom: Enemy Unknown, and suddenly all attention shifted to that game and the shooter was largely forgotten. 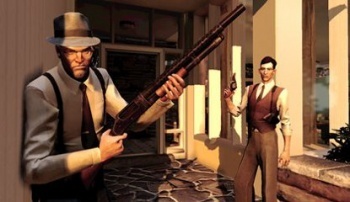 Virtually nothing was said about it following the announcement of Enemy Unknown until January, when the game was pushed back to Take-Two's 2013 fiscal year, and now it's been delayed it again, this time to FY2014. Take-Two isn't saying why the XCom shooter has been pushed back so far; it's possible the company is a little nervous after seeing what happened to EA's attempt to remake a much-loved strategy game into a shooter, or maybe it just wants to give Enemy Unknown plenty of room to make its mark. It's also quite possible, and even most likely, that the game just isn't shaping up the way it was expected to. Whatever the reason, the timing is certainly coincidental: the same day that Take-Two announced a delay in XCom: The Shooter in Desperate Need of a Subtitle, it also slapped a firm launch date on XCom: Enemy Unknown.